The 2019 Byron Bay Property Sales Ocean Swim Classic will be held on Sunday 5th May 2019, check-in at 7am at the surf club. This is our 32nd Classic and our 12th Mini Swim. Donations from 2018 swim were $76,000 to 21 various charitable organisations. Total money raised is now $901,000 since our original swim. The Byron Bay Property Sales Ocean Swim Classic is approximately 2.2 from Wategos Beach to Main Beach, Byron Bay. The Classic is a buoyed course from the start area, around The Pass and across the Bay to Main Beach. The Byron Bay Mitre 10 Mini Swim, is designed for those who can competently swim approximately 800m from Clarkes Beach to Main Beach. It is to encourage participants to put a toe in the water (so to speak) and draw in more swimmers who may not be as experienced or as confident as the Classic swimmers. 7:00am – Check-in and issue of timing bracelet, swim cap, event T-shirt or baseball cap at the Surf Club, Byron Bay on Sunday May 5th from 7am. 8:00am – The Byron Bay Mitre 10 Mini Swim check-in must be completed in time to allow entrants to walk to Clarks Beach for their race start. 8:45am – The Byron Bay Mitre 10 Mini Swim staggered start at The Pass area. The actual Start area is dependent on the conditions of the day. 9:00am – The Byron Bay Property Sales Ocean Swim Classic check-in closes. 9:00am – Race briefing for the Classic takes place at the tents outside the Surf Club. 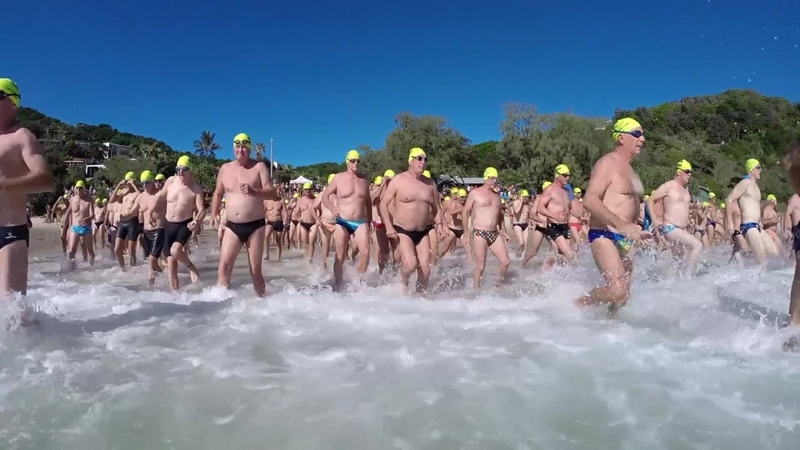 9:15am to 10:00am – Buses leave the Surf Club for the start line at Wategos Beach. A secure baggage storage area is provided round to the right on the road side of the Hall. 10:00am – Staggered starts for the Classic commences. Those who wish to wear clothing to the start for weather protection are reminded there are no facilities for these to be returned to the Surf Club. There will, however, be a clothing bin available for those that wish to donate clothing items to local church groups. 12:00pm – The Presentation is scheduled to start with lucky draws for entrants, raffle draws, as well as the Swim Presentations. Further information and registration at www.byronbayoceanswimclassic.com.au.